Bake 48 to 55 minutes or until deep golden brown and toothpick inserted in center comes out clean. Cool completely, about 1 hour. Cut cake in half lengthwise, then cut crosswise 11 times to make a total of 24 slices. Place 1 or 2 cake slices in each parfait glass or banana split dish. Top each serving with 2 small scoops of ice cream. Spoon strawberries over one scoop. 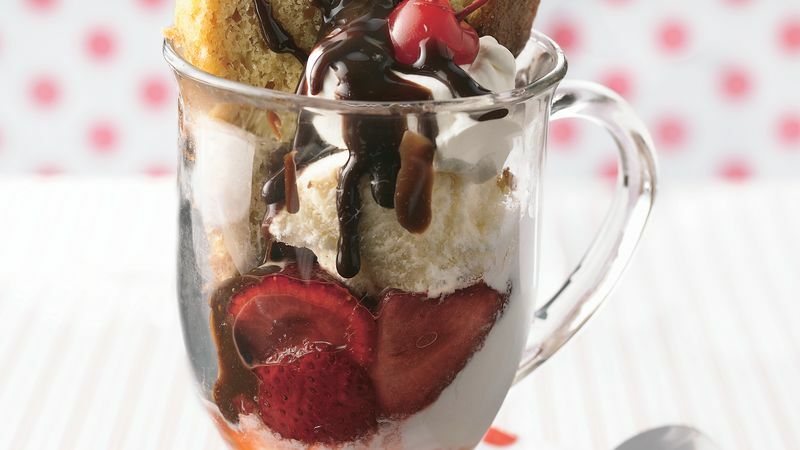 Drizzle hot fudge sauce over other scoop. Top each with whipped topping and cherry. Store cake covered.